Many moms wonder if it is okay for them to use white noise. They of course are concerned over sleep props and don’t know if white noise is one, and if using noise will create sleep problems at some point. We first started using white noise last year when Brayden was 3.5 and Kaitlyn was 1.5. It was purely accidental. We have dry winters and their skin was getting dry, so we put humidifiers in each bedroom. I realized it created some white noise for them, and I liked it! We have since started keeping a humidifier in each child’s bedroom all year round. I really, really, really, really (etc) wish I had thought to use white noise when Brayden was a baby. We lived in a house that we were remodeling, and there were no finished bedrooms. We all slept in the formal living room. We were basically living in a studio apartment. A humidifier next to his bed would have made it so I could move around more without waking him up. At about 6 months old, we finally realized we could move him into the bathroom, which was big enough we could put a crib in it and still have plenty of room. This made things much better, but white noise still would have been helpful. Having the humidifier in McKenna’s room has been really great. The other two children are able to be kids all day without me stressing out over them being noisy during nap time. I still teach them to be respectful of others while sleeping (something I wished some of my roommates in college would have learned! ), and we have rules about inside and outside voices, but they can be kids in the house even while McKenna was asleep. This wasn’t a problem when Kaitlyn was a baby because Brayden just isn’t a noisy person by nature. Plus, you get two kids together and you have a lot more noise than you do with just one child. So how does McKenna sleep when there isn’t white noise? She still sleeps just as well. We have power outages often. We also have gone camping. When we visit grandparents, we don’t bring white noise with us usually (at Christmas, we took her humidifier to my parents because we were going to be eating right above the room she sleeps in…with a wood floor beneath our feet). When she doesn’t have the white noise, she still sleeps just as well. She can fall asleep without it. She can stay asleep without it. You can use lots of different things for white noise. There are Humidifiers . There are white noise machines (I have heard moms like DEX Products Sound Sleeper SS-01 ). There are tracks on iTunes or other sites where you buy your mp3s. You can get free tracks here: http://cantonbecker.com/music/white-noise-sleep-sounds/index.html. There are box fans (Lasko 3733 20-Inch Box Fan or Holmes #HABF120W White Pers Box Fan ). Maybe the room baby is in has a ceiling fan. These are just a few examples–if you have a favorite, please share! This is ultimately the way I see it. Sleep is important. Using white noise allows the noise of family members to be drown out. Then the family can move around normally and the child can sleep. When you visit family–let’s face it, some of them are loud!–you can bring along white noise. Then you can relax and enjoy yourself rather than stress out about the noise going on. I wish I would have known about white noise when my oldest was a baby. We have used it with our newest, who is 4 months old and it's been a life saver! Her bassinet had music, nature sounds and white noise on it. It was great to lull her to sleep or even worked to calm her when she was fussy.We discovered the 5 S's through, "Happiest Baby on the Block", one of them being shushing, or white noise. There have been a few time when nothing was working to calm her down when she was fussing. One time I walked into the bathroom and turned on the blow dryer and it was instant calm and she fell asleep. Another time in the car, she got extremely fussy and we weren't quite to our destination yet, so we found static noise on the radio and she went right back to sleep! She is now out of the bassinet, but we haven't gotten a white noise machine or anything else like that, but I really like your idea of the humidifiers. We have wood heat, so we need the moisture anyway. We live in a small house, and our Homedics "noise machine" is truly a lifesaver. We like to use an air purifier for white noise in our little girl's room. She can sleep without it, but it sure does make me feel more at ease when my two year old goes squealing down the hallway during nap time! I just got back from a 10-day trip to Texas with my 7 month old daughter for a family wedding. My daughter sleeps with white noise and has since 6 weeks old. (It has made such a difference in her sleeping and staying asleep since we started using it.) My family is LOUD!!! My daughter slept in a bedroom in the back of the house with her white noise and never woke because of the noise while we were on the trip. Lifesaver! Our white noise is the only thing that helped us get through the 45 minute intruder!! My daughter's room is in the front of the house near the street. I close the curtains for naps but she still had trouble with transitions around the 45 min mark. As soon as I started using white, noise she napped like a champ and still does. I bring it every where – even friends' houses when we are at a party and she will go to sleep anywhere. LOVE LOVE LOVE it.We use the SleepMate from Amazon. I think you can get it from Target.com as well. I couldn't agree more. When my son was first born I was really anti noise machine, but it's a life saver. We travel with ours, but I feel like it brings a little bit of home into a new surrounding and it gives him comfort. He has no problem falling to sleep without it though. We use the Homedics noise machine from walmart. It's $20. Sorry my question if off subject. My almost 10 week old seems to be in a vicious cycle of a growth spurt. It seems that we'll have a "growth spurt" period of lots of wakefulness, short naps, wanting to eat every 2 hours, etc. Then, we'll wonderfully settle into being woken to eat at the 3 hour mark, 2 hour naps, etc. What bothers me, though, is that this cycle has been continuous for weeks now. A few days of hunger, a few days of sleep, etc. My son was over 9 pounds at birth and is around 13 pounds now. He's gaining weight great, but I still question my milk supply. Do you think this continuous cycle is due to the fact that I just won't produce enough to satisfy him because of his size? He's still waking once at night to eat as well. Any thoughts? thank you for posting this….i've had a hard time with white noise. our house is so loud and we have to use fans or humidifiers while the kids sleep. i'm always concerned that they will become addicted. thank you for the peace of mind! I discovered WN with my DD when she was about 6mo. It has been a life saver! I was always paranoid about noise and constantly stressed when there was extra noise in the house e.g. visitors etc and wouldn't do anything while my DD slept for fear of waking her. I use a CD player with a static noise track on repeat. Alternatively I use a fan. I don't use it all the time but particularly during the day when there's neighbourhood noise or I want to make a bit of noise doing household chores.Recently we took it away on hols with us and it was my sanity! DD was carted around in her portacot a lot but slept perfectly with her routine and the WN. For NY Eve we had fireworks 100mtrs from the house and she didn't even stir!Anyway, we haven't found it to be a sleep aid – rather an invaluable settling tool! I love our white noise machine. We live in a huge city in Asia, and it can be noisy! (Last month, they were drilling in the apartment below us.) We have a small travel-sized noise machine that we take with us wherever we go. I find it is especially helpful in dealing with jet lag, and it is also great when we travel and all need to sleep in the same hotel room. My daughter doesn't mind being without it (our power goes out alot), and one time I forgot the plug and she slept in the same room with us with no problems. Our second baby is due in May and I will definitely get one for her, too. We can't live without our loud fan in our daughter's room. We didn't start using it until she was well over 1 years old. Whenever we'd have people over in our tiny apartment and it would get noisy, my back became so tense and all I could think about was if she would wake up. And she often did. We moved but the problem remained. In fact, our daughter's room is right next to the bathroom. On normal days, she wakes up at 8 am. But on days when my husband took a shower before 8, she immediately woke up. We put a fan in her room to see if it would help. It was the answer! Now my husband and I can now take a shower, clean the bathroom, have loud people over and we know she won't wake up due to noise. Added bonus, when we go to visit friends and family, we often have to sleep in the same room as our very alert light sleeping toddler. With the fan on, we can sneak into the room without her waking up and noticing. We will definitely use white noise with all our other children! 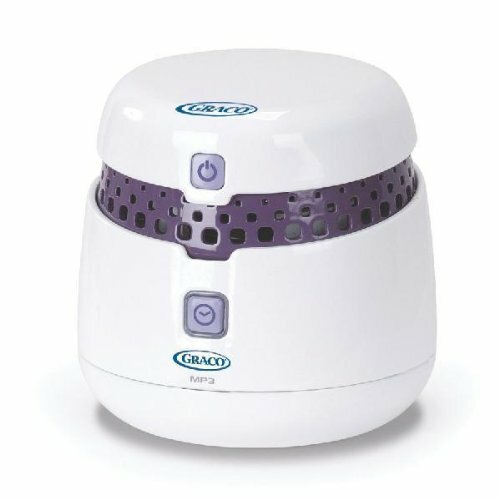 We use this sound machine: http://www.walmart.com/catalog/product.do?product_id=5913225and absolutely LOVE it!! It has lullabies but also different sounds on there and we use the ocean sound, which sounds like white noise. It also projects things on the ceiling, which helps with it not being pitch black in our daughter's room. I, too, agree that white noise is a huge live saver! When I was a new mom, I was against all that stuff (room darkening, noise, etc.). I was going to have the child who could sleep through anything, so I would often put her in a pack n' play downstairs to nap so she could get used to sleeping with house noise. Well, that theory quickly went out the window when she would never sleep longer than 30 minutes and I was exhausted!! I remember the very first time I hung something over her window and turned on a little fan…she slept for 1 1/2 hours! I was sold from that point on. She is now 2, and we still use it. I do have a question for everyone. I babysit at someone else's house 3 days a week, where I also bring my daughter and she takes naps there. I am constantly lugging her fan back and forth everyday, and I was wondering if anyone has found something smaller and portable for noise making. Something I could just leave in the car so I don't have to remember her fan from her room everyday?? Thank you all! We use a fan for our 8 month old when we know that the house might be loud during her nap or we want to make sure that she has a good nap. This ends up being approximately one nap per day. As a result, she has not become dependent on the fan. I would say that she sleeps well without it, but sleeps better with it. We use a teddy bear we bought for around $18. It has rain, ocean waves, wind and heartbeat sounds. It has an adjustable timer, 25 or 45 minutes, and adjustable volume. I love it. The crib is in our room, and it doesn't bother either of us. Our son can sleep without it, though. It's relaxing, and actually helps me get to sleep faster also. Thanks everyone for sharing your white noise experiences! Natalie, I just have to tell you that the #1 place I want to visit right now is NYC. Even above Hawaii. I am a big believer in White Noise….well we actually use Brown Noise. Did you know there are actually different colors of noise? I found this out while shopping for a White Noise track on iTunes. Brown is deeper sound than White. We feel it is less harsh and more tolerable. My husband says it sounds like we're in a space ship when we have it on in our rooms. We started using "noise" in our own room before our 1st daughter was born when I was pregnant and getting up every hour for the bathroom. It masked the creeking in the floor boards and helped my husband have more continuous sleep.PORTABLE WHITE NOISE – We use a track on iTunes that stays on a continuous repeat loop. We bought it for .99 cents and it's called "brown noise loop" from the "white noise loops for sleep" album. We put it on multiple iPods and keep one of those iPods in our DDs room on a speaker system there. Then when we travel I bring portable speakers and my own iPod and use it for her when we're staying over night at my moms or sister's house. This always works great since I always bring my iPod with me when I travel anyway. Another white noise method that worked the first 6 months was from the "Sleep Sheep" http://www.amazon.com/Cloud-Sleep-Soothing-Sounds-Nature/dp/B000J6CDY6. The noise maker in the stuffed animal can be removed and it's small enough I can just throw it in the diaper bag. I think the rain and ocean settings were our favorite.One last very inexpensive white noise option if you have a radio in your child's room is the Static Noise from the AM radio. Sheri, now that you mention that, I do remember hearing there are different colors of noise. Thanks for all of your added ideas!